Goalscape Desktop — Visual Goal Setting Software for Success. It’s a neurological fact: Goal setting activates our inner reward system. This system is the basis of drive and motivation. If we want to increase our drive and motivation, we need to be clear about the goals we want to achieve. Goalscape provides this clarity and at the same time fosters the motivational energy that is required to succeed. Goalscape allows us to break down big challenges into manageable slices, without losing the big picture overview. Goalscape also makes sharing goals really easy and supports goal-focused communication with anyone who helps you to achieve your goals. Increasing motivation and making meetings more productive — with less time spent to prepare and follow-up — produces dramatic savings for teams and businesses of all sorts. Goals often revolve around our ideas about future possibilities. Yet developing a powerful, healthy and well balanced goalscape requires acknowledging the past and appreciating the present. 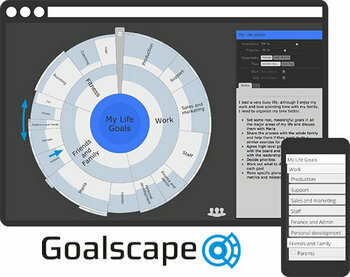 Goalscape makes it easier for people to be happy and productive in the now, while working towards big goals for the future. No matter how big or complex the challenge, Goalscape is the ideal way to set goals and create a visual hierarchy. Drag and drop goals to move or copy them as you create your project. Goalscape's unique visual interface is highly intuitive and there are infopoint videos and tooltips on all major functions for quick, painless learning. Goalscape Desktop runs on any Windows PC or Mac OSX machine. Goalscape Online runs in any major browser on any computer and most tablets – and there is a free 'companion' mobile app for any Android or iOS device. See your priorities at a glance. Set a goal's importance by dragging its border (or use the slider) – all its neighbours resize automatically. Lock subgoals to fix their importance. Record progress in the bottom-level goals – that's where the action happens. As you work you can see your progress advancing across the goal map, which reinforces your motivation. Assign responsibility for goals to individuals or groups. You can also add timeframes or just set due dates (check the options in Settings). Include background details on any goal as notes, attach files in any format (images, documents, spreadsheets, videos, etc) and use hyperlinks to access external websites or filesharing facilities. Highlight goals by Due Date, Responsibility or Tag – or any combination of those attributes. Import and export from/to MS Project or MindManager and export PNG or JPG images as well as PDF, Word and Excel reports. Collapse outer levels to optimize your view and use focus view to “zoom in” on a subgoal at any level to show all the details below it. Apply color to individual goals, subgoal areas or entire sectors. You can also mark goals with red, amber or green ‘traffic light’ dots to indicate urgency. Use Settings to select your language (English US/UK, German, Spanish, French, Italian, Japanese, Korean, Polish, Czech or Slovak), apply a logo, choose a color scheme and set other options. 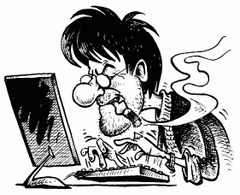 Goalscape supports most common keyboard shortcuts and provides extensive right-click functionality. For smarter presentations and efficient goal-focused meetings, there is a ‘full screen’ view with the menu bars stripped out and a simplified panel. You can also show images directly from goal attachments. Goalscape starts up with a 'Get started...' user guide, which contains templates for some common uses of Goalscape. There are more templates on our Templates page.